Limerick gloves were were ridiculously thin and delicate. 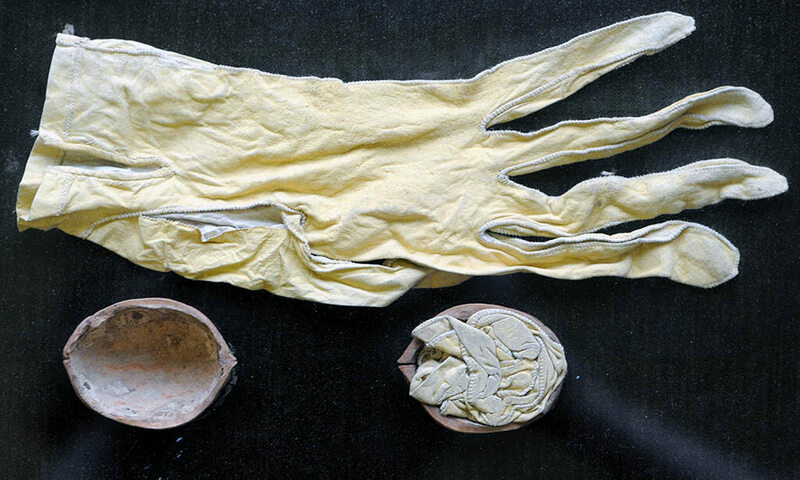 The gold standard for gloves was determined by the walnut shell test, if the pair of gloves could be folded so tight that they would fit into a walnut shell, they were suitable for the upper classes. Some pairs were so delicate that they could only be worn once. The gloves were prized not only for their delicacy, but also because they were smooth inside as well as out, something unknown in a leather glove at the time. They were very popular as a means of skin care, in some cases they were infused with oils, and worn at night to help keep ladies’ hands plump, soft, and white. Although attempts were made to manufacture the gloves outside of Limerick even as far away as France, those from Limerick were considered the best. The first person to create this style of glove was Cornelius Lyons who had a glove making factory in Mary Street, Limerick from at least 1769. In 1786, his son James Lyons posted the following notice in the Saunders’s News-Letter cautioning members of the public against buying gloves from others claiming to be Limerick gloves. 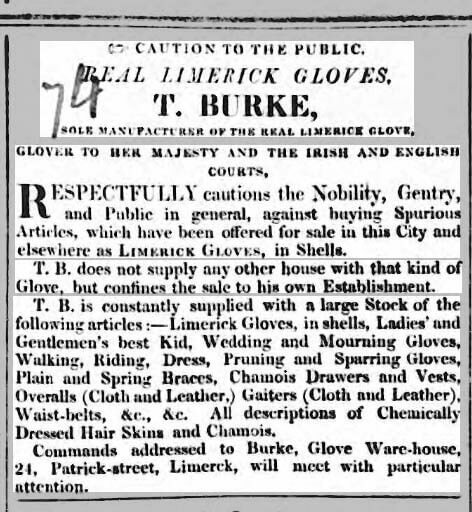 The other manufacturer of Limerick Gloves in Limerick were Michael Burke and his son Thomas Burke. Michael Burke supplied a dozen gloves to Queen Victoria in 1839 for her personal use. After Michael’s death in 1843, his son Thomas would continue to supply the Queen with gloves. The Limerick between locally made Limerick gloves and Queen Victoria was severed with the death of Thomas Burke on July 27, 1869. 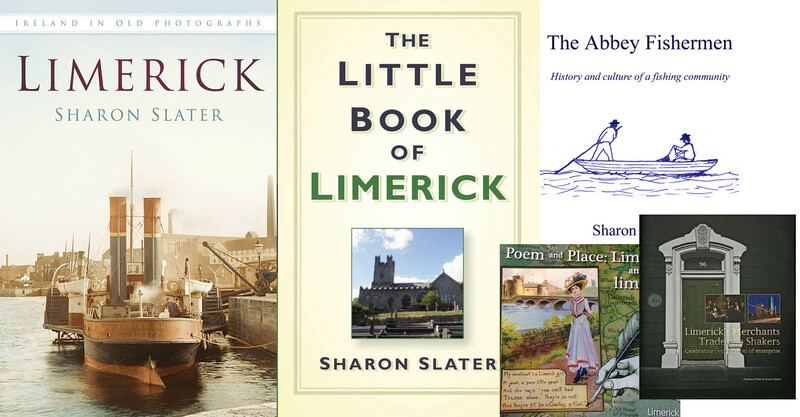 Novelist Maria Edgeworth (1768-1849) wrote a love story involving Limerick Glove in 1813. These gloves were very popular with Queen Victoria, who also adorned herself with Limerick Lace. There are examples of these gloves in Limerick Museum. Dents Museum. Chambers’s journal, Volume 26 By William Chambers and Robert Chambers, 1852; Saunders’s News-Letter 18 Feb 1786; New international encyclopedia, Volume 10 Dodd, Mead, 1915; BBC: Chicken skin gloves and Nelson; The Penny magazine of the Society for the Diffusion of Useful Knowledge, Volume 4 By Charles Knight, 1835; Limerick and Clare Examiner 21 Jan 1846.